Representative Susi Hamilton poses with the Pop Warner National Champion Junior Pee Wee cheer squad, coaches, parents and Superintendent Mark Cramer. RALEIGH, NORTH CAROLINA: January 4, 2012 – It doesn’t happen often, but this time The Roger Bacon Academy cheerleaders received a cheer instead of giving one. And it came from two of the largest platforms in North Carolina: the NC House of Representatives and the NC Senate. 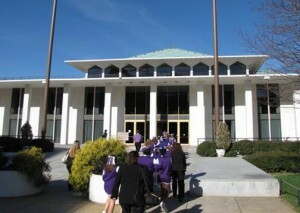 Representative Susi Hamilton invited The Roger Bacon Academy Pop Warner National Championship Cheerleading Squad and their coaches to be recognized by the NC General Assembly when they reconvened in Raleigh at 2:00p.m. on Wednesday, January 4th, 2012. All 23 members of the squad, coaches, parents and RBA staff went to Raleigh on Wednesday morning. The team sat in the visitor’s gallery and were recognized at the beginning of the House of Representatives session. Speaker of the House Thom Tillis introduced the team, coaches and Superintendent Mark Cramer which prompted the first standing ovation (watch video HERE). Representative Susi Hamilton continued the acknowledgement and read a statement praising the team. After her remarks the House gave the students another standing ovation. 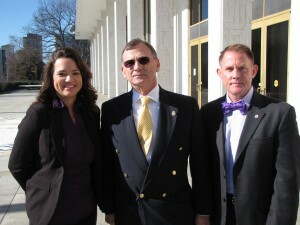 (L to R) Cheer Coach Jean LaFave meets with NC Senator Bill Rabon and Superintendant Mark Cramer before the National Championship RBA Junior Pee Wee cheer squad makes its way to the Senate gallery. 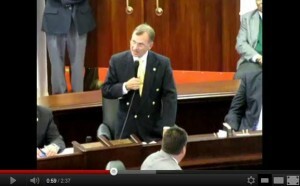 The cheer squad was also asked to be recognized in the NC Senate by Senator Bill Rabon (watch video HERE). The group was ushered over to the Senate gallery where Lt. Governor Walter Dalton stopped the session to recognize the national champions from Leland. He then turned the floor over to Senator Rabon who also read a statement honoring the RBA Cheer Squad. The team was again cheered by the entire Senate floor. “We hereby extend our most heartfelt congratulations and commendation to members of The Roger Bacon Academy Junior Pee Wee Cheerleading Squad. On December 5th, 2011 in Orlando, Florida, these nine, ten, and eleven year-old students from Charter Day School in Leland won First Place in the National Championship Pop Warner Cheer Competition. In addition to winning the National Championship in their division, The Roger Bacon Academy Squad also won the coveted “Spirit of Sport” Award – an award on which all the competing teams vote for the one team that best exemplifies sportsmanship in its highest form. RBA Junior Pee Wee National Championship cheer squad are beaming after being congratulated by Representative Susi Hamilton in Raleigh, NC. The national recognition gained by these young girls from Leland sets an example for all of us that with a positive attitude, honed work ethic, and tireless dedication there is no limit to what can be achieved. It is to be noted that the cheer squads at The Roger Bacon Academy have no tryouts and are open to all students at Charter Day School with a “C” or better grade average. Every student willing to work hard and commit to the team’s goals will become a member of the cheer squad. Also noteworthy is that this National Championship team is totally self-supporting with all volunteer coaching and all expenses for mats, equipment, and travel being paid for by bake sales and other team fund raisers. No taxpayer funds go toward this winning team of charter school students. So let us applaud these students and their volunteer coaches from The Roger Bacon Academy – Charter Day School in Leland, North Carolina for setting an example of the potential for success that lies within each of us. The girls were thrilled to be honored on both stages and learned a little about how state government works as well. “We are so proud of our cheerleaders and their extraordinary accomplishment” said Mark Cramer Superintendent. “And we are honored and thankful that our distinguished legislators invited these young girls to stand before them and be praised for their awards,” he continued. 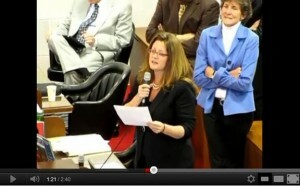 VIDEO: RBA Cheer Squad honored by the NC House of Representatives. 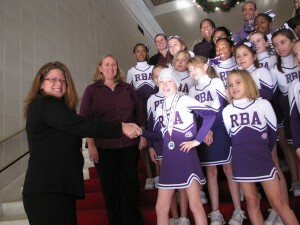 VIDEO: RBA Cheer Squad honored by the NC Senate. Photo Gallery: National Championship Cheerleaders from Leland recognized by the NC General Assembly.